"... this city is being overrun by baboons?" "Well, isn't that the fault of the voters?!" 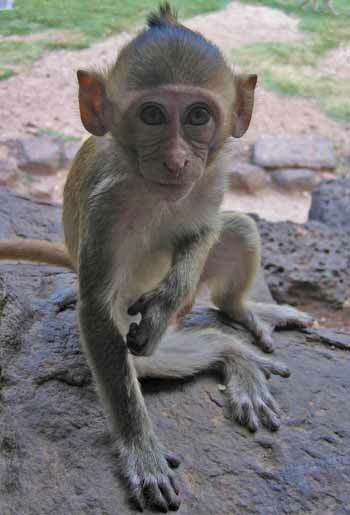 Lopburi is well known for its population of resident monkeys. Like most abandoned animals, the monkeys found refuge with the monks, who have a tendency to take in all manner of waifs and strays. The locals have adapted to having these creatures around and most shop fronts/houses have been made monkey-proof. Evidence of special monkey foil wrapped around TV antennae and cages mounted in front of hotel windows show that the residents have learnt the hard way from their mischievous behaviour in the past. So, why do they tolerate these animals? 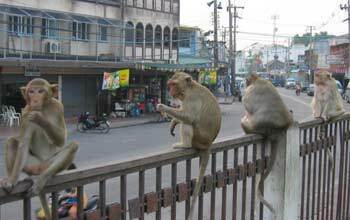 Well, the inhabitants of Loburi believe that the delinquent behaviour of these monkeys is far out-weighed by the tourism they attract into the town. According to some of the locals, these monkeys have settled in well too. A few of them have been known to jump on the trains and take day-trips elsewhere, only to return back to Lopburi in the evening. Love them or loath them, the locals have found a way to co-exist in this small town with the monkeys. When we first arrived late yesterday afternoon, we noticed monkeys roaming around the streets, and that includes the roads. Monkeys could often be seen crossing the busy intersection to get from one wat to another but the town's traffic seems to have got used to them and slows down accordingly. It was a surreal sight to see them wandering around all over the place so freely; a few of them were even swinging from the electricity pylons. There are two troops of monkeys - the ones that hang around the wats, 'temple monkeys', and the other 'town monkeys' who hang around the shops near to where we are staying. From our room, we can see both troops as our hotel, Indra Hotel, is right in the middle of monkey land. The 'temple monkeys' hang out at San Phra Kan (a shrine) during the day and Wat Phra Prang Sam Yod during the late afternoon, with just one road separating the two. These 'temple monkeys' are on border territory. We left our hotel late in the afternoon and didn't get very far, for just outside was a troop of monkeys swinging from the metal barriers covering the windows. The shopkeepers on ground level were having fun with this bunch moving them along with long metal poles and igniting firecrackers (throwing them on the pavement, not directly at the monkeys, I should add). It was all very spontaneous and fun to watch as the monkeys scarpered across, lightning quick. The ones hanging off the cables did not get away with it either and a shopkeeper ran his metallic pole along the length of a cable in pursuit of one particular monkey. One thing flashed across my mind and that was death by electric shock. Both beings seemed completely oblivious to this fact and maybe I was worrying too much on their behalf. Still, I took a few paces back just in case! 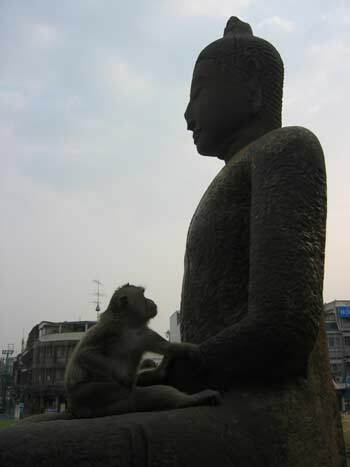 From the corner of the main road, we could see the 'temple monkeys' by Wat Phra Prang Sam Yod. A few of them were eating cabbages at the road side and a vast number of them could be seen rolling around, chasing one another and climbing on the tourists. We payed our entry fee and were led around by a young boy whose purpose was not to provide commentary, but simply to keep an eye on the animals and shoo them off if they got out of control. We were led inside the stone temple first and the door was closed after us. This was going to be our haven away from the monkeys for a short while. The ruins smelt of monkey excrement and didn't look particularly impressive from inside but it was a good way to introduce us gently to them i.e. behind caged windows. Once we were brave enough, we ventured back outside. There were monkeys everywhere. A few latched onto Ian's leg, clambered up his back and then up on to his shoulder. I, on the other hand, preferred them not to climb onto me and the young Thai boy did a good job shooing them away. But not before one of the quicker monkeys made his way up to my shoulder and pulled several strands of hair from my head. Frowning at the stinging sensation, I watched him proceed to use my hairs to floss his teeth. Cheeky but ingenious! 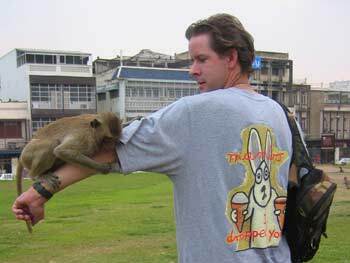 A monkey clambers up Ian's arm (out of shot, another two are working their way up a leg each!). 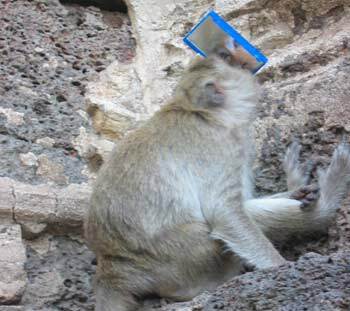 Monkeys are very mischievous creatures and a few were running around playing with empty carrier bags and looking into compact mirrors that they must have stolen from unwary tourists. I even spotted one with a half broken pair of spectacles and he placed the remaining lens over both of his eyes to reveal a magnified set. It made me chuckle. Check me out! Monkey looks intently at his reflection in the mirror. After spending two hours with the monkeys, we left the wat. They are fascinating to watch and there were just so many of them. While it was good to see so many living freely, there must come a point when the total number of monkeys will become too much of a handful. The town will become well and truly besieged by the little blighters and it wouldn't be the fault of the voters! What will they do with them then?